The far South Coast of New South Wales is blessed with great natural beauty, thoroughly deserving the title of “Sapphire Coast”. 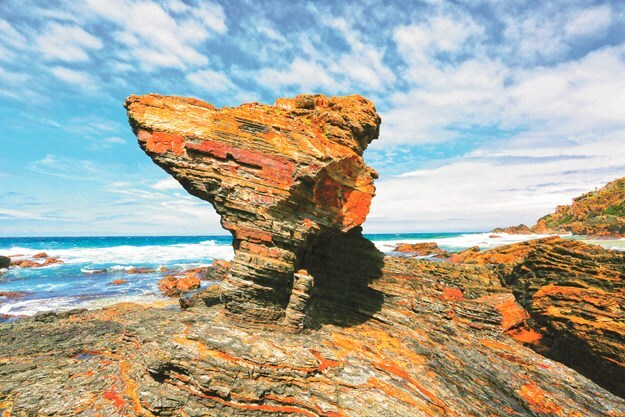 At its glittering heart is the Mimosa Rocks National Park, named after the paddle steamer Mimosa, wrecked in 1863 at Bunga Head in the northern end of the park, and the region's spectacular geological formations. Mimosa is one of several national parks and nature reserves that jointly protect more than three-quarters of the South East Corner Bioregion. 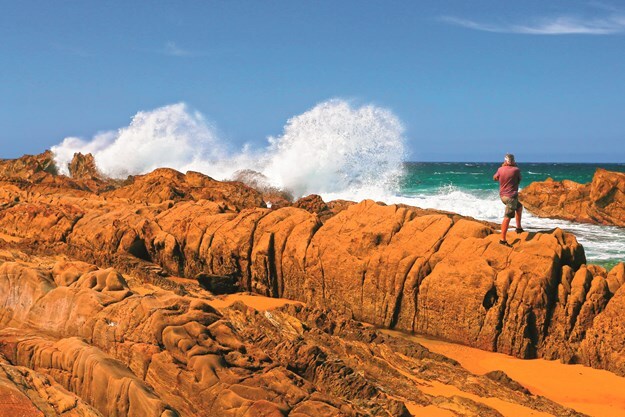 Covering 5804 hectares, Mimosa straddles 20km of coastline between Tathra and Bermagui, where the continental shelf is narrow and steep and has been deeply incised by erosion from high-energy waves. Sedimentary rocks deposited about 400 million years ago were intruded and buckled by volcanic activity to produce striking rock pedestals, columnar jointing and the castle-like sea stacks of the Mimosa Rocks at Aragunnu. Fossil deposits in this section of the park include the earliest known club mosses found in Australia and fish from the Devonian period. 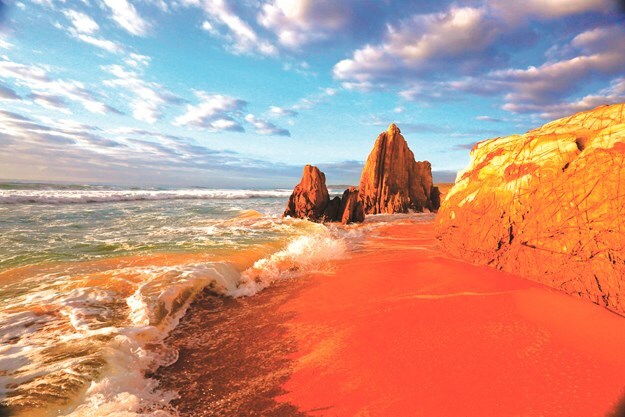 Further south, dramatic headlands embrace isolated coves and punctuate long golden beaches. 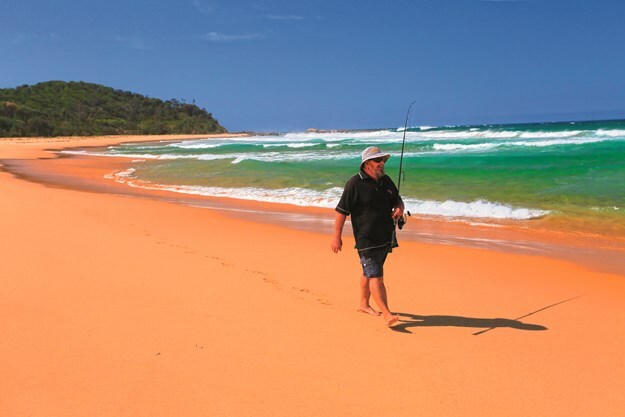 Between Middle Lagoon and Baronda Head, Cowdroys, Gillards and Middle Beaches extend virtually uninterrupted for almost 5km along the edge of a sandy, undulating plain. A hinterland of wooded ridges and valleys protects Nelson and Middle Lagoons and Wapengo Lake, fringed by saltmarsh, mudflats and mangroves. Mimosa occupies a zone of transition where subtropical and warm and cool temperate climates overlap, producing a mosaic of native plant communities that includes scrub on the sandy plains, tea tree, heath and banksia on hind dunes and headlands, thickets of relict rainforest in sheltered gullies, paperbarks, sedges and herbfields in low-lying marshes, and woodlands of woollybutt, spotted gum and ironbark with dense understoreys of burrawang and fern. In turn, these diverse habitats harbour large numbers of native animals — 39 species of mammals, 115 birds, 21 reptiles and 12 different amphibians — some of them rare or endangered. The park is also visited by a suite of migratory shorebirds which are protected under international treaties. These include the bar-tailed godwit, which stops here briefly in summer during its migration from Alaska to New Zealand — the longest known non-stop flight of any bird and the longest journey without pausing to feed by any animal. Mimosa Rocks NP lies within the traditional country of the Yuin Aboriginal people, which extends southwards from the Shoalhaven River to near the Victorian border and inland to the eastern edges of the tablelands. Archaeological records indicate that the Yuin have inhabited this region for at least 20,000 years. Oral tradition and physical evidence suggest that, prior to the arrival of Europeans, the Yuin maintained a thriving society that incorporated sophisticated exchange patterns and a rich social and ceremonial culture. The coastal fringe and forests provided plentiful readily-accessible resources which supported relatively large numbers of people for long periods. Rock exposures along the coast also yielded raw materials for tool production. The arrival of European settlers in the region in the 1830s seriously disrupted Yuin society, restricting their ability to travel over and use the resources of their country, and decimating their population by outbreaks of smallpox and influenza and violent altercations. The displacement of the Yuin was further entrenched as many people migrated, or were forcibly moved to government reserves such as the one established at Wallaga Lake in 1891. Some Aboriginal people were employed by Europeans in the whaling industry as farm labourers, domestic servants and police trackers. Despite this turbulent history, contemporary Yuin people maintain a strong connection with the park, which contains features and locations of cultural significance through ancestral traditions and stories of creation beings. Certain communities and families regularly camp within the park and continue to pass on knowledge associated with the area from one generation to the next. For more than 150 years, the land now included in Mimosa Rocks NP served a variety of very different functions for Europeans. The entire coastal fringe was partitioned and sold, with suitable parcels of land cleared for grazing or the establishment of orchards and gardens. The hinterland forests were logged for railway sleepers and pulpwood, the native wildlife was hunted for fur, creek lines were scoured for gold, and Aboriginal middens were mined for shells to make lime for use in building mortar. Evidence of these various activities abounds across the park’s landscape. Here and there, holiday houses replaced huts and farmhouses. In 1886, the first oyster lease was issued, beginning an aquaculture industry that continues today at Nelson Lagoon and Wapengo Lake, bordering the national park. Several coves were used for regional shipping and a number of shipwrecks are scattered along the coastline of the park. The sea stacks at Aragunnu claimed the Mimosa in 1863, with the loss of two lives; a second vessel also went aground on Aragunnu Beach in 1932; the remains of an unknown 19th century vessel is occasionally exposed in the sands at Nelson Beach, while ships were also wrecked off the entrance of Wapengo Lake in 1880, at Bunga Head in 1908, and at Picnic Point in 1932. Mimosa is a popular destination, attracting some 140,000 visitors annually for a host of recreational activities that includes camping, picnicking, walking, fishing, swimming, surfing, canoeing, vehicle-based sightseeing, cycling and simply relaxing. Visitation to the park is highly seasonal, with peak periods (accounting for almost one-third of annual numbers) corresponding with summer school and Easter holidays. But the park still offers many attractions during other seasons, such as whale watching from its many headlands during spring, and winter wildflowers which attract colourful honeyeaters and lorikeets. 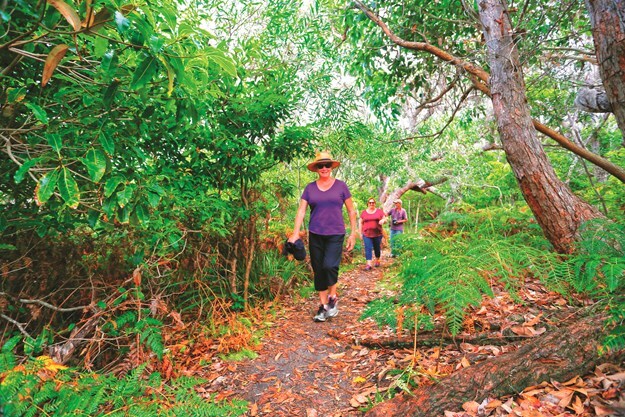 Walking is most commonly undertaken along beaches and around rocky headlands in the vicinity of the main camping areas. There are no lengthy walking tracks in the park, although a number of short walks have been developed. At Middle Beach, a 30m paved path suitable for wheelchairs extends from the carpark to a lookout, while a signposted 700m sand track provides walking access to the shoreline and mouth of Middle Lagoon. Two signposted walking tracks commence at the Wajurda Point/Moon Bay carpark. A 500m step-free track leads to a lookout on the end of Wajurda Point and a 250m track descends steeply via steps to the northern end of Moon Bay. Moon Bay can also be accessed from the carpark at the end of Bay Drive at Mogareeka Inlet. From here, a 600m track which is closed to vehicle traffic leads to the site of the former 'Riverview' farmhouse. Disused tracks can be followed for a further 700m to a signposted walking track which descends to the southern end of Moon Bay. Short tracks also lead from the Bithry Inlet carpark to the shores of the inlet, from Cowdroys Road to Cowdroys Beach and Green Gully, and from the Nelson Beach carpark to Nelson Beach and Lagoon. In the far northern end of the park, former farm tracks provide walking access between North and South Bunga Beaches across Goalen Head and to Hidden Valley.